Moto today officially launched Moto Z2 Play in India which was announced in the US last week. It comes with Snapdragon 626 processor and 4GB of RAM. On Design Moto Z2 Play comes with a Metal body design and just 5.99mm thin.Moto Z2 Play feature a 5.5-inch (1920 x 1080 pixels) Full HD display powered by 2.2GHz Octa-Core Snapdragon 626 processor with 4GB RAM and 64GB of internal storage. On Camera, it has a 12MP rear camera with dual-tone LED flash, Dual-Pixel Autofocus, f/1.7 aperture and 5MP front camera with dual tone front facing LED flash for better low-light selfies. Moto Z2 Pay runs on Android 7.1.1 Nougat and has a Night Display feature to reduce blue light emissions in the evening. There’s also a redesigned fingerprint scanner and new voice controls that will provide information instantly without having to touch or unlock the phone.Packed with a 3000mAh Battery which is less compared to 3500mAh Battery on Moto Z Play. Moto Z2 Play is Compatible with the Mods launched last year as well. 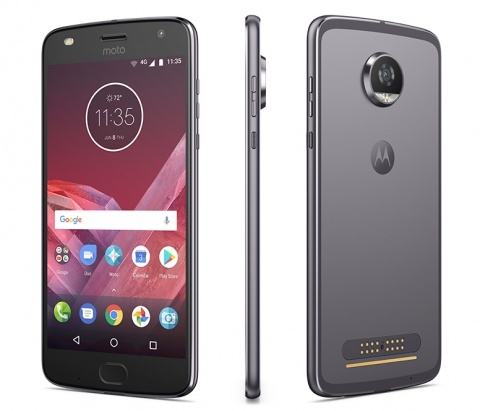 Moto Z2 Play comes in Lunar Grey and Fine Gold colors priced at Rs 27,999 and will be available for Pre-order on Flipkart and Offline retail stores from June 15th. It is compatible with all old Moto Mods and the new JBL SoundBoost 2 Mod, Moto TurboPower Pack Mod, Moto Style Shell with Wireless Charging and Moto GamePad Mod will be available later this year.